All has not been well with the 22 out of 23 local government councils in Rivers State. 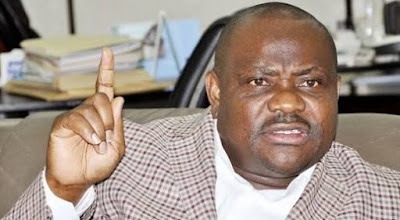 Information available to us has it that Wike has withheld over two months (august and september) allocations to these local government councils. investigations reveals that the governor deducted 50million from each council's federal allocations totalling #1.1billion naira and took away to abuja to continue his corrupt practices of bribing judges who are willing to do his bidding, intensify his campaign of calumny against former governor Rotimi Amaechi and sustain his corrupt associates at the detriment of development of the local government areas in the state and their staff. This development has indeed brought hardship to the local dwellers, increase crime and hunger, in addition to the illegal, hopeless, criminal and clueless caretaker committees that were constituted across these councils on the 9th July and dissolved 9th October 2015. Our source further informed us that Chief Nyesom Wike diverted all council accounts from their original bankers to a new generation bank on Olu-obasanjo road were they help him fix the funds before releasing it, to enable him make profit from the fund. We are advised to call on the Nigeria Immigration Service to change their corrupt watch men at the Port Harcourt Intl airport who allow Nyesom Wike and his aides carry large volume of cash across the security scanning machines without reporting to relevant agencies to arrest and prosecute these criminals. As I compile this information, Rivers State doesn't look like a state with the presence of a state government as the governor has relocated to abuja with most of the state officials and leaving the state to his deputy without any operational powers. As the police and other security agencies are battling to fight crime without any support from the state government. We therefore appeal to Chief Nyesom Wike to return the funds he stole from these councils and see to the release of all funds due the local goverment councils to enable them pay salaries and reduce poverty in the land. As the federal government has since released all allocations due these local government councils to the state.